Around the Year in 24 Pints: Back on the Road. Following my longest absence from running in years (over two months), I took to the roads yesterday evening as the sun was setting. A beautiful evening it was too... strange days for November. The route was simply down to the pier, up to Cóilín Daddy's house and then back - three miles on the dot. To be honest, I thought I would suffer a bit more for my absence than I did, but having said that it was still tough enough from the two mile mark onwards. Why did I abstain? I wasn't carrying an injury, I wasn't sick and I didn't have a death threat hanging over me from the anti-running terrorist group. Simply, I felt like taking a wee break. Hopefully this has enthused me to get back in love with the open roads. I just started my break. I can't wait to get into it! 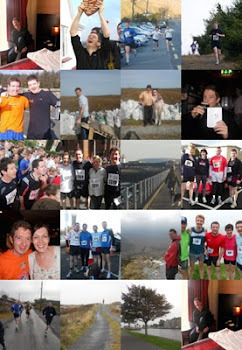 Good to hear you're back running again - and back in our blogosphere. The rest will have done you good. Wish I could force myself to take one, it all gets a bit much after 27 years! Stick at it. I also need a break, but I don't like missing even 1 day of running... So if you don't mind I think I will take one of your months rest, So 4 weeks for you and 4 for me!!! I think I will go for a run ofter the 4 weeks of rest you have just given me, I think it's time. Great to hear you are back running and planning to run a race on December 14. You have enough time, Brendan, ... you'll be adequately trained for the 4 miler in Wexford and enjoy the event. Completely agree with Runningfox (see above his comment): You would have to go back along the running path! I'll probably run my first race of the year next Sunday, January 5th: it willl be a 7 km short race which is really an odd distance: I have heard of 5 and 10 km short race but not of 7km. Anyway, running that race will give me motivation according to my goals: I'll try to run a race a month this year. I will be looking forward to reading about your runs, Brendan. Thank you Giorgio and Runningfox... I had to cancel Tombrack due to the bad weather here... but I'm back and definitely fired up for 2014!